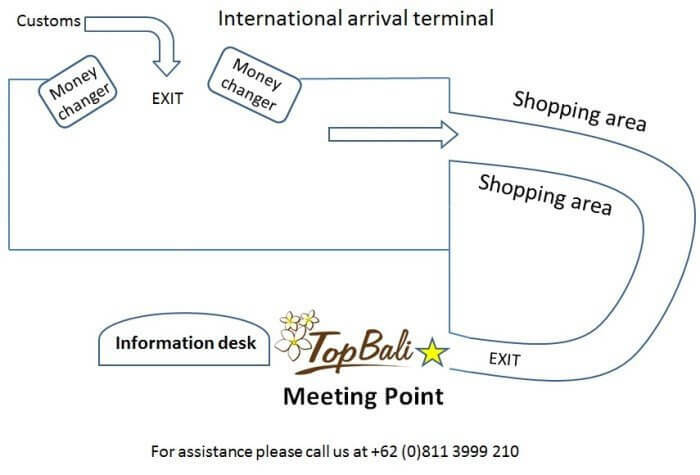 Below are further details on where our driver will meet you depending on whether you arrive on at the international arrival terminal or domestic arrival terminal. When you land in Bali you will enter the international arrival terminal where you will first process immigration formalities and then collect your luggage. Our driver will then meet you after you exit the international arrival terminal. Below is a floor map of where our driver will meet you. Our driver will be waiting for you at this meeting point. He will be carrying a signboard with your name and our easy to recognize TOP BALI logo printed on. Please give us a call in the unlikely event you cannot see the driver. Our phone number is +62 811 3999 210 (phone call and WhatsApp). You are already in Indonesia and you are travelling to Bali on a domestic flight. You will arrive at the domestic arrival terminal. You will first collect your luggage and then exit the terminal building. Our driver will meet you after you exit the arrival terminal. 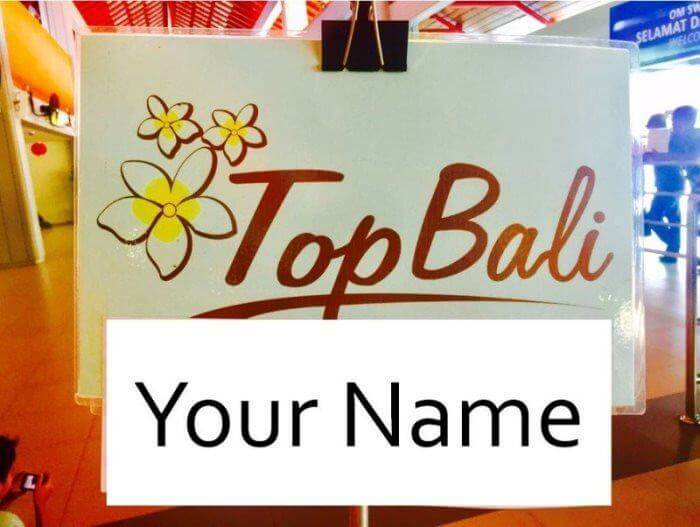 Your driver will be carrying a signboard with your name and our easy to recognize TOP BALI logo printed on. Please give us a call in the unlikely event you cannot see the driver. Our phone number is +62 811 3999 210 (phone call and WhatsApp).